Tags Posts tagged with "Condolence Notes"
If you want to show your sympathy or support to someone suffering a loss then you may want to write and send a condolence note. A condolence note is a few short words or sentences offering your condolences and sympathy. Usually written or printed on a small note with a pretty design. 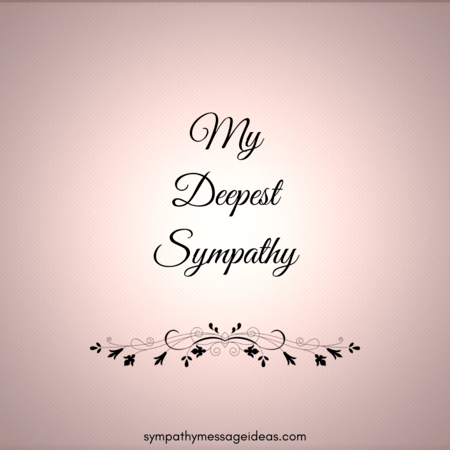 It differs from a sympathy letter, which is far more detailed, or a sympathy card, which often contains a single condolence message. Writing a condolence note doesn’t have to be difficult. You might be worried about saying the right thing or making sure what you write is perfect but remember that the bereaved will appreciate the time and effort of just sending one. If you’re finding it hard to come up with the right words then these sample notes should give you some good examples of the types of things to say. 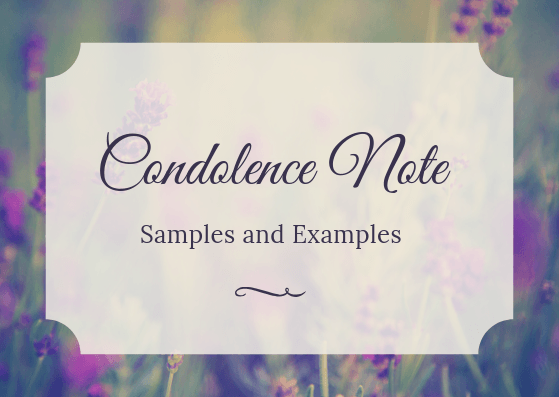 So use the condolence note samples and examples below as either a guide to writing your own or use them as they are. If you have decided to write your own note rather than using some of the examples below then there are some steps you can follow. You don’t have to stick to them all, and it’s important to use your own judgement as to what’s appropriate. But hopefully it will give you a starting point of how to write your own condolence notes. Start by recognising the loss that has been suffered. Possibly mention the deceased by name, if you knew them well enough. Next you should express your condolences. This can be tricky if you aren’t sure what to say but either use the example notes below for inspiration or our sympathy and condolence messages to help with the best wording. Follow this with a personal touch. Maybe mention their best qualities or a memory you have of them. Offering support or help is always appreciated, if you can. It doesn’t have to be very specific but just something like “I’m there for you” can be very touching. End your note with a heartfelt wish or expression and sign your name. Never use phrases such as “they’re in a better place”, “it was God’s plan”, “it’s for the best” etc. Whilst you may have the best intention with saying something like this they can be very offensive and upsetting at such a difficult time. Religion can be sensitive so is best avoided. Unless you are 100% sure the recipient will appreciate a note that has a religious element or tone to it then it is probably better to stay away. Avoid bringing up the details of the death of the deceased. Going over those specifics whilst the bereaved is grieving will only remind them of the loss and bring back the pain. I’m so terribly sorry for your heartbreaking loss. You have my deepest sympathies at this truly awful time. If you need my help, support or just someone to listen I’ll be there for you. Words cannot describe the sorrow I felt on finding out about _____’s passing. Their generous spirit and warmth was clear to everyone who met them. They will be sorely missed and never forgotten. Hoping you find the strength and love in friends and family to face the tough days ahead. I was so saddened to hear about the death of your mother. I can’t begin to imagine how difficult this is for you. She was a wonderful woman who had time for everyone. Her selflessness and generosity will be missed by all who knew her. Please know that I’m thinking of you and sending my prayers. You have my deepest sympathies. I just wanted to extend my most heartfelt condolences for the loss of your mother. Losing your mom is one of the hardest times you can go through. I can’t begin to imagine how hard this is, and very little I can say will help. But remember how much love and support you have around you. All your friends, including me, will be there for you. My deepest sympathy for the loss of your father. He was a great man who touched all who knew him. His honesty, compassion and sense of right were such an influence to everyone that was lucky enough to get to know him. The loss will be felt amongst so many of us. Please accept my most sincere and deepest condolences. I can’t express how sorry I was to hear of your dads passing. All I have are the most fond memories of him. He was the definition of a ‘great man’. I hope you’re coping and don’t think twice about reaching out. I was so sad to learn of your brothers passing. He was one of the most funny and genuine people you could hope to meet and lit up every room he was in. I know how painful this must be for you so if you need anything please, just ask. Your brother was one of my closest friends and losing him is more painful than I could ever have imagined. So I can’t begin to comprehend what you’re feeling. I just wanted to let you know how special he was, and how much he’ll be missed. I’ll never forget the time we spent together. Your sister was a truly special person. Her willingness to help anyone in need her and always find the good in others was an inspiration to us all. The world is a less happy place without her. Please accept my sincerest condolences for your loss. I didn’t get to know your sister very well but everything I’ve heard is what a remarkable person she was. I know her loss will leave a hole in so many people’s hearts. If you’re struggling or need to talk I’ll be there for you at any time. My deepest sympathies for the loss of your grandmother. She had the heart of an angel and was always there for whoever needed her. I still can’t believe she’s really gone. Please don’t think twice about asking for anything you need. I’m always at the end of the phone or just a short drive away. I never knew your grandmother but I do know how hard losing someone so special to you is. Remember your friends and family are there for you and will be with whatever you need. I was deeply saddened to learn of your grandfathers passing. His wisdom and kindness was ever present and something everyone found so touching. And I’ll never forget that twinkle in his eye! I hope you’re doing okay and can be there for anything you need. Although I didn’t know your grandfather well I know how close you were. The loss of someone so special is always heartbreaking. Nothing I can say will offer much comfort but I wanted to reach out and pass on my condolences. You are in my thoughts and heart in this trying time. I was so sorry to learn of the passing of your son/daughter. I know these words alone will do little to console you I just wanted you to know that I/we are here for you if you need anything. Please don’t hesitate to ask. Your sons/daughters memory will live on forever. I can’t even start to have any understanding of what you’re going through. My words will mean nothing so all I wanted to say was that I will be there for you, whatever it is you need. You’re not alone.